The port of Bolles Harbor at 41.86905;-83.3890 on Lake LAKE ERIE, Great Lakes Region, USA During Walleye Fishing season on Lake LAKE ERIE, Fishing charter captains provide Walleye and Perch fishing reports. Lake LAKE ERIE is known around the world for outstanding Walleye Fishing and The western basin of Lake LAKE ERIE is home to millions of walleye. 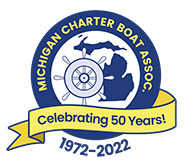 When choosing a Walleye Charter Captain always look for a member of the Michigan Charter Boat Association to be sure your captain complies with state and federal regulations.